Alfasi, Yitskhak. "Sefer Hayakhas Lebeit Eliash". Jerusalem, 1975. Alsheikh, Moshe. "Torat Moshe". Dyrenfurth 1799. Alter, A.M. "Darkei Polin Avelot". Jerusalem, 1987. American Jewish Year Book - 1903 - Biographical sketches of rabbis. Aronson, Mary. "Echoes and Re-echoes of our Past".USA.privately printed 1916. Assuline, Hadassah. "Mifkad Yehudei Eretz Yisrael 1839". Census of Jews in Eretz Yisrael in 1839. Jerusalem, 1987. Australian Jewish Historical Society - Journal Vol.XII 1993. Avraham, ben Eliyahu. "Saarat Eliyahu". Grodno, 1876. Avraham, ben Eliyahu. "Rav Pealim". Warsaw, 1894. Balaban, M. "Dzieje Zydow w Krakowie i na Kazimierzu". Krakow, 1912. Barzin, A.Z. "Kedushe Tarpat".Jerusalem, 1930. Bayuk, Y.M. "Emunat Torat Moshe". USA c.1920. Behrman, S. "Mishpakhot K.K. Shklov". Jerusalem, 1936. Beider, A. "A Dictionary Of Jewish Surnames from the Russian Empire". Teaneck, NJ. USA. 1993.
copy of original manuscript from the archive of the late Shmuel Gorr. Bloch, Avraham David. "Tzitzit Hakanaf". Vilna, 1934. Boyarsky, Tsvi Hersh. "Tosefet Shabat". Warsaw, 1886. Braverman,V. "Sefer Anshei Shem". Warsaw, 1892. British Consular records in Jerusalem.Gorr archive. Buber, Shlomo. "Anshei Shem". Krakow, 1895. Cohen, C.G. "The Shtetl Finder". Los Angeles, 1980. Dansky, Miriam. "Gateshead". Israel 1992. Danzig, Avraham. "Khokhmat Adam". Vilna, 1828. Dembitzer. "Klilat Yofi". Krakow, 1888. Dubnow, Shimon. "History of the Jews in Russia and Poland". Philadelphia, 1916. Edelman, T.H. "Gedulat Shaul". London, 1854. Efrati, Eliezer. "Dor vedorshav". Vilna 1889. Eizenstadt, B. "Dorot Haakhronim". Brooklyn 1937. Eizenstadt, B. "Dor Rabanav Vesofrav". Vilna, 1900. Eizenstadt, B. "Letoldot Yisrael Beamerica" . New York, 1917. Eliyahu, the Gaon of Vilna. "Aderet Eliyahu". Dubrovno, 1804. Eliyahu, the Gaon of Vilna - commentary on "Bamidbar", "Devarim". Vilna 1866. Eliyahu, the Gaon of Vilna. "Derekh Selula". Vilna, 1826. Eliyahu, the Gaon of Vilna. "Kane Khokhma". Vilna-Horodno, 1829. Eliyahu, the Gaon of Vilna. "Mikhtav Eliyahu". Prague, 1811. Eliyahu, the Gaon of Vilna.- commentary on "Mishlei". Vilna, 1803; Prague, 1814. Eliyahu, the Gaon of Vilna. "Yahel Or veNefesh David". Vilna, 1882. Eliyahu, the Gaon of Vilna - commentary on "Shulkhan Arukh, Orakh Khaim". Shklov,1803. Eliyahu, the gaon of Vilna - commentary on "Shulkhan Arukh, Even Haezer".Vilna, 1819. Eliyahu, the Gaon of Vilna - commentary on "Shir Hashirim".Warsaw 1842. "Encyclopedia Shel Galuyot - Warsaw". Farfel, Y.L. & Bloch, A.D. "Divrei Eliyahu". Lakewood, USA. 1947. Feingold, Stephen W. "From Raseyn to Worcester: The Generations of Gershon Mendele Ziv". USA. 1983. Feinstein, A.L. "Ir Tehillah". Warsaw, 1880. 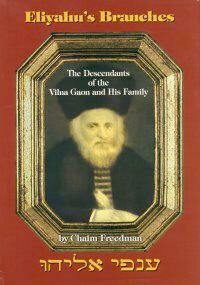 Includes biography and details of family compiled by Prof. Louis Ginsberg. An edition published by Tsvi Luria (Jerusalem 1947) has notes by Eliyahu Landau. Finfer, Pesakh. "Torah Mitzion" .Jerusalem, 1898. Finfer, Yitskhak. "Divrei Yitskhak". Pietrikov 1911. Finkelman, S. and Scherman, N."Reb Moshe".Brooklyn 1986. Finn, Shmuel Yosef. "Kiryah Neemanah". Vilna 1860. Finn, Shmuel Yosef. "Knesset Yisrael". Fishman-Maimon, Yehuda Leib. "Sefer Hagra". Jerusalem 1954. Freedman, Chaim. "Our Fathers' Harvest".Petah Tikvah 1982, supplement 1990. Friedenstein, S.E. "Ir Giborim". Vilna, 1880. Friedman, Natan Tsvi. "Otsar Harabbanim". Bneir Brak 1975. Friedman,P.and Gliksman,P.Z. "Stary Cmentarz Zydowski w Lodzi" Lodz 1938. Frumkin, Y.L. "Toldot Khakhmei Yerushalayim". Vilna, 1874. Funk & Wagnalls. "The Jewish Encyclopedia". Gervitz, M. "In Our Leaders' Footsteps". Jerusalem, 1965. Gilbert, Martin. "Atlas of the Holocaust". London, 1982. Ginzberg, Louis. "Students,Scholars and Saints".New York, 1958. Gorr, Shmuel. "Jewish Personal Names, Their Origin, Derivation and Diminutive Forms." Teaneck, NJ. USA.1992. Gorr, Shmuel. "Yiddishkeit" Issue No.2.(Jer. 1986). "From Kelme to Melbourne"
Greenbaum, Masha. "The Jews Of Lithuania". Jerusalem, 1995. "Haavar", journal of Russian Jewish history. Tel Aviv. Halevy, Zev. "Emek Halakhah". Vilna, 1845. Heilprin, S.E. "Sefer Hatsetzaim shel Rabbenu Shneour Zalmen Miladi". Book of the Descendants of Rabbi Shneur Zalmen of Liadi. Jerusalem, 1980. Heilprin, Y. "Pinkas Vaad Arbah Artzot". Jerusalem, 1945. Horowitz, Tsvi. "Kitvei Hagaonim". Pietrikov, 1928. Horowitz, Y.M. "Gidul Tzion". Jerusalem 1910. Jung, Leo. "Jewish Leaders". Jerusalem, 1953. Kadishowitz, Kalmen Yitskhak. "Toldot Yitskhak". Keidan, 1937. Kagan, Berel. "Sefer Haprenumeranten". New York, 1975. Kahana, S.Z. "Anaf Etz Avot". Krakow, 1903. Kahanowitz, M. "Sefer Zikaron lekehilat Ivia". Tel Aviv, 1968. Karlinsky, Kh. "Harishon Leshoshelet Brisk". Jerusalem, 1984. Katz, Dov. "Mussar Movement". Tel Aviv, 1975. Khaim ben Simkha. "Retzon Yereyim".Vilna 1859. "Khaklaim Yehudiim Bearbvot Russia". Jewish Agriculturalists on the Russian Steppe. Tel Aviv, 1965. Khaver, Y. "Aderet Eliyahu". Tel Aviv, 1955. Khevra Kadisha Anshei Maamad" - register of Vilna burial society, 1836-1904. Gorr archive. Klarsfeld, S. "Memorial to the Jews Deported from France". New York, 1983. Klausner, Yisrael. "Korot Beit Haalmin Hayashan Bevilna". The sources of the old cemetery in Vilna. Vilna, 935. Klausner, Yisrael. "Toldot Hakehilah Haivrit Bevilna". Vilna, 1935. Klausner, Yisrael. "Hapulmus hapenimi Bekehilat Vilna". Jerusalem, 1940. Kovno Khevra Kaddisha registers - Gorr archive (Chaim Freedman). Klyaza, M.Z. "Tov Lezikaron". Vilna, 1896. Kossowsky-Shachor, Yaakov. "Masoret Shaul".Bnei Brak, 1981. Kremer, Hillel. "Divrei Hillel". Pietrykov, 1898. Landau, Betzalel. "Hagaon Hakhassid Mivilna".Jerusalem 1978. Landau, Betzalel. "The Vilna Gaon". translated and edited by Y. Rosenblum. New York, 1994. Landau, Eliyahu. "Maaseh Rav". Jerusalem, 1896. Levin, Yehoshua Heshel. "Aliyot Eliyahu". Vilna, 1855. Levy, Arnold. "The Behr Tree". Taunton, England, 1949. Lewin, Y. "Eleh Ezkereh". New York, 1957. Lipman, D.M. "Toldot Hayehudim beKovno veSlobodka". Keidan, 1931. Lipshitz, A.L. "Avot Ateret Levanim". Warsaw, 1927. Luntz, Yehuda Leib. "Kovetz Shoshanim". Warsaw, 1892. Luria, Tsvi. ed. "Maalot hatorah" (by Avraham Ragoler). Jerusalem 1947. Maggid, David. "Toldot Mishpakhat Ginzberg". St.Petersburg, 1899. Mandelbaum, Simkha. "Asara Dorot Be-Eretz Yisrael". Jerusalem, 1994. Margolis, M.L. & Marx, A. "A History of the Jewish People". Philadelphia, 1963. Markovitch, Moshe. "Lekorot Hair Keidan Urabbaneha". Warsaw, 1913. Markovitch, Moshe. "Lekorot Hair Rassein Urabbaneha". Warsaw, 1913. Markovitch, Moshe. "Shem Hagedolim Hashlishi". Vilna, 1910. Michelson, T.Y. "Beit Yekhezkel". Pietrikov, 1924. "Misgav Ladakh" - records of old age home in Jerusalem. Gorr archive. Mokotoff, Gary & Sack, Sallyann. "Where Once We Walked". Teaneck, NJ. USA. 1991. Morgenstern, A. "Geulah Bederekh Hatevah".Jerusalem, 1989. Morgenstern, A. "Meshikhut Veyishuv Eretz Yisrael". Jerusalem, 1985. Moshe, ben Yehuda Leib of Pinsk. "Shnot Eliyahu". Lemberg, 1799; Warsaw, 1860. "Nature" Vol 339, 1989 - "New Light on the Lysenko era". Neumark, Avraham Yaakov. "Eshel Avraham"
Nikitin,N. "Yevreiski Zemlyedeltsi" Jewish Agriculturalists. St.Petersburg, 1887. Ovchinsky, Levi. "Nakhalat Avot". Vilna, 1894. "Pinkas Hakhevra Kaddisha DePraga" - 1788-1870. Minutes of a burial society in the Praga district of Warsaw. Original manuscript held by "The Central Archives for the History of the Jewish People", Jerusalem, Israel. "Pinkas Klois Hagra" - the minutes of the Gaon's study circle - manuscript held by the "Central Archives For The History Of the Jewish People"
"Pinkas Khevra Kadisha Slutsk" - records of the burial society in Slutsk, Byelorussia, c.1650-1925. Records of donations from Chicago Jews to the settlers in Eretz Yisrael during the nineteenth and early twentieth century, published in "Shemesh Tzedakah" and researched by Shmuel Gorr with notes by Charles Bernstein (Chicago). Rabinowicz, H. "The World Of Hasidism". London, 1970. Rabinowitsch, W.Z. "Lithuanian Hasidism". London, 1970. Rabinowitz, Meir Mikhel. "Meir Leolam" - Vilna, 1903. Ragoler, Avraham. "Maalot Hatorah". Vilna, 1824. Ran, Leyzer. "Yerushalayim Delita". New York, 1974. Rapaport, David. "Tsemakh David". Keidan 1925. Personal archive containing his research, that of his father Eliezer Rivlin, and genealogical lists of Rabbi Eliyahu Landau. Jerusalem. Rivlin, Eliezer. "Sefer Hayakhas Lemishpakhat Rivlin veHaGaon miVilna." Jerusalem, 1935. Rivlin, Eliezer. "Hatzadik Reb Yosef Zundel MiSalant Verabotav".Jerusalem, 1927. Rivlin, Kh.Z. "Khazon Tzion". Tel Aviv, 1947. Rosenblum, Yehoshua Mordekhai. "Heavar" Tel Aviv, 1965. Rosenstein, E. & N. "Latter Day Leaders, Sages and Scholars". Elizabeth, NY. USA. 1983. Rozenkranz, A. "Sefer Yukhsin". Warsaw, 1885. Sackheim, George. "Scattered Seed". USA. 1986. Schechter, Solomon. "Studies In Judaism". New York, 1958. Schwartz, Pinkhas Zelig. "Shem Hagdolim". New York 1958. "Sefer Zgierz". Tel Aviv, 1975. Selavan, Ida. "In Search of Sarah Menkin Foner"
Shabad, Avraham Khaim. "Toldot Hayamin". Vilna, 1904. Shapira, Yaakov Leib. "Mishpakhot Atikot Beyisrael" Ancient Families of Israel. Tel Aviv, 1981. - records of donors and recipients of funds supporting Jewish settlers in Eretz Yisrael - 1884- 1924.Gorr archive held by Chaim Freedman. Shverdsharf, M.Y. "Nakhalat Yesharim". Sziget, 1903. "Sinai" 1961. Mossad Harav Kook, Jerusalem. - article by Benyamin Rivlin about the children of the Gaon. Sirkis, Pinkhas. "Ish Haemunah". Tel Aviv, Israel. Stern, Y.Z. "Zekher Leyehosef".Warsaw. 1898. Teller, Hanoch. "The Lion's Share, Reb Leib Gurewitz." "The Age", newspaper, Melbourne, Australia. The Jewish Agency." Register of Jewish Survivors". Jerusalem,1945. "The Jewish News", newspaper, Melbourne, Australia. "The Times", newspaper, London, England. Tidhar, D. "Encyclopedia lekhalutsei hayishuv ubonav". Tel Aviv, 1947. "Toldot Kehilat Pinsk 1506-1880".History of the community of Pinsk 1506-1880. Tel Aviv, 1973. Treves, H.D. "Avodat Hakohen". Warsaw, 1889. Wasserman, Yosef Zundel. "Megilat Hayakhas". Tel Aviv, 1957. Weinkle, Marcus Joseph,memoirs 1928,edited by Charlotte Chassin. "Who's Who in America 1972"
Wilensky, Mordekhai. "Khassidim Umitnagdim". Jerusalem, 1970. Wolf, V. "Der Geshikhte fun di Yidden in Lettland'. The History of the Jews in Latvia.Riga, 1923. "Wolkovisker Yizkor Book" - New York 1949. Wunder, Meir. "Elef Margaliot". Jerusalem, 1993. Yaari, E. "Igrot Eretz Yisrael". Ramat Gan, Israel, 1971. "Yahadut Latvia". Latvian Jewry. Tel Aviv, 1953. "Yahadut Lita". Tel Aviv, 1967. Yedaya, ben Avraham. "Or Khakhamin". Horodno, 1795. Zagorske-Menkin, Efraim. "Torat Almavet". Vilna 1860. Zandman, Felix. "In a Hole Under the Floor"Anti Defamation League Bulletin, 1989. Zeligman, Yisrael. "Megilat Yukhsin". Privately published, Latvia, c.1939. Zev Wolf halevy. "Emek Halakha". Vilna 1845. "Zikhron Eliyahu ". Bnei Brak, Israel, 1989. Zinovitz, Moshe. "Mir". Tel Aviv 1981.